Gain valuable insight into how your callers are behaving when they reach your business number. Telzio Call Logs show more than just call history. Get a detailed view on everything that happened on the call including what option the caller pressed in your phone menu, how long it took for agents to answer, and who hung up the call. 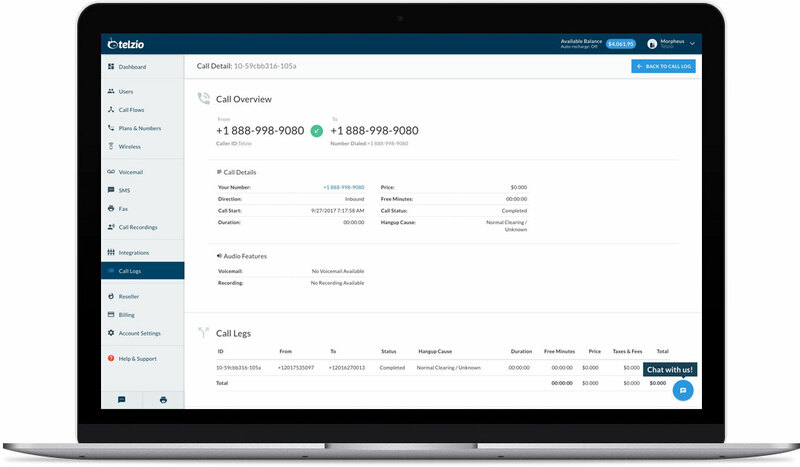 View a complete record of incoming and outgoing business phone calls, including the caller's number, where the caller has dialed, and the outcome of the call. What can I do with Call Logs? View detailed call activity, such as which User answered the call, what option the caller pressed in the Phone Menu, and minutes used. Find associated Call Recordings and Voicemails for calls. Filter and export Call Logs as an excel file. Make Call Logs accessible only to certain employees. Call Logs are useful for managers and administrators to access call history and keep track of usage. For example, you can sort the Call Log by phone number and date, export the list to excel, and then email it as an attachment. Is there a limit to data stored in the Call Log? No! There's no storage limit with your calls, Call Recordings, Voicemail, Faxes, or SMS.